For many households, the kitchen is the center of activity. At Elizabeth Swartz Interiors we encourage homeowners to express personal taste and style in this busy epicenter of their home – and what better way to achieve this than by creating a colorful kitchen! 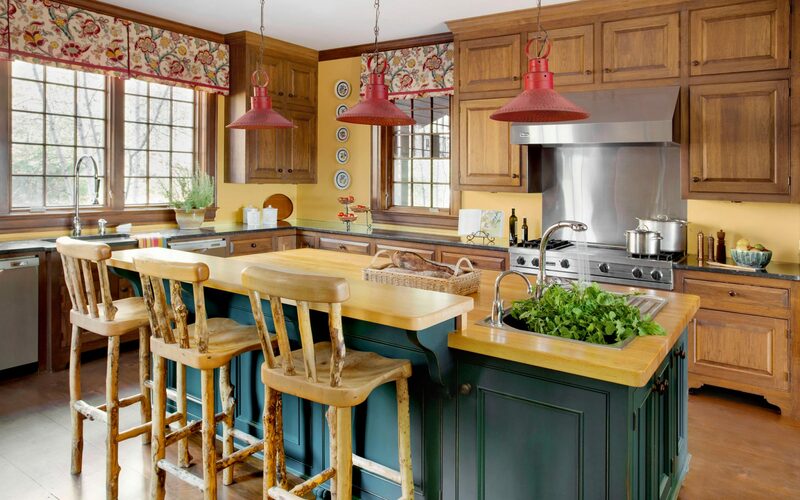 The following kitchens, designed by Boston interior designer, Elizabeth Swartz, ASID, show how adding color can create a beautiful and colorful kitchen that is inviting and uniquely you. 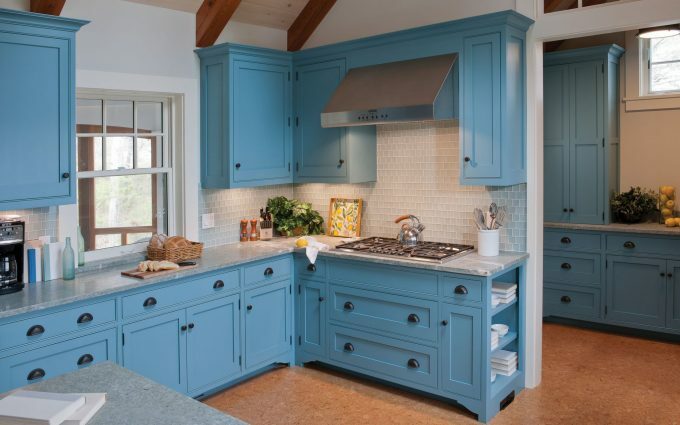 Large or small, a kitchen can incorporate the colors you love in cabinetry, wall paint, fabrics, and accents. Say “good-bye” to the all white kitchen and “hello” to color! Cabinets are available in many colors, and custom cabinets can be finished in any color. While white cabinets are popular, they can be less forgiving with both fingerprints and scratches than a bolder color. “We will always design for our clients’ individual taste, but are delighted to work with color,” says Elizabeth Swartz, ASID. The kitchen is a focal point of this Martha’s Vineyard beach cottage. We worked with the homeowners to create a space that is both cozy and fresh, and reflects their personal taste and style. The blue color palette reflects the Scandinavian heritage of the homeowner and adds an uplifting ocean-side feel. 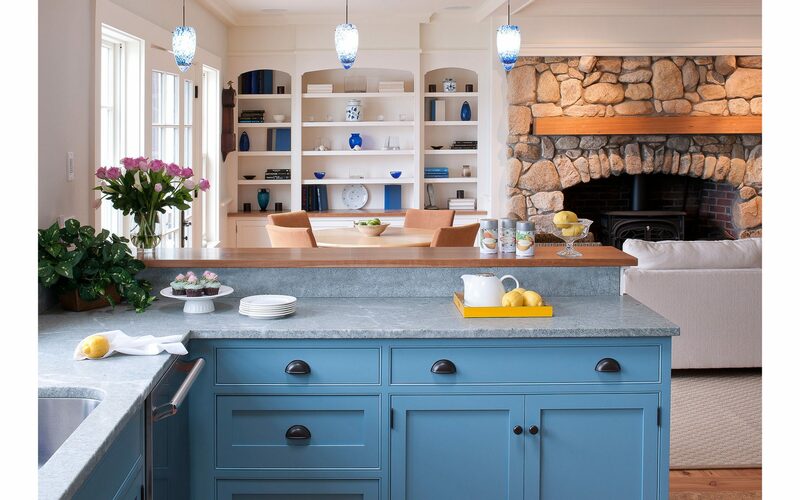 As a result of choosing Farrow & Ball Stone Blue #86 paint for the cabinets, we created a stunning colorful kitchen that is refreshing, calming and comfortable. Our clients also wanted their new waterfront escape to be bright and cheerful, so we chose a beach inspired color scheme. The blues are thoughtfully coordinated throughout the kitchen with a frosted glass tile backsplash, natural cork flooring, soft blue-green marble countertops, and clean white accents. “Bring the outdoors in,” was the homeowner’s vision for this New Hampshire home. Custom cabinets finished in a meadow green color bring balance and harmony to this pool-side pavilion kitchen. Furthermore, natural materials coordinate with the cabinets including fir paneling on the walls, a Vermont slate backsplash, and mottled stone flooring tiles. The result is a colorful, nature inspired kitchen. In this lakefront cottage we chose a deep blue by Sherwin Williams (#6804 Dignity Blue) for the cabinet color. The kitchen’s bold color reflects the waterfront surroundings and contrasts with the light wood paneling in adjacent spaces, therefore creating a focal point in this open floor plan. 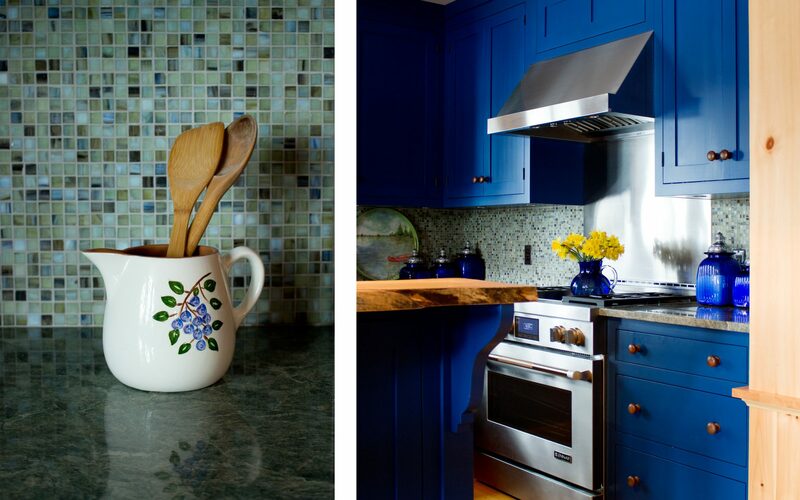 A mosaic tile backsplash in varying shades of blue and green coordinate with the blue painted cabinets, further contributing to the cool and calming aesthetic of this vacation retreat. Whether designing a new kitchen or renovating an existing one, there are many design decisions to make. 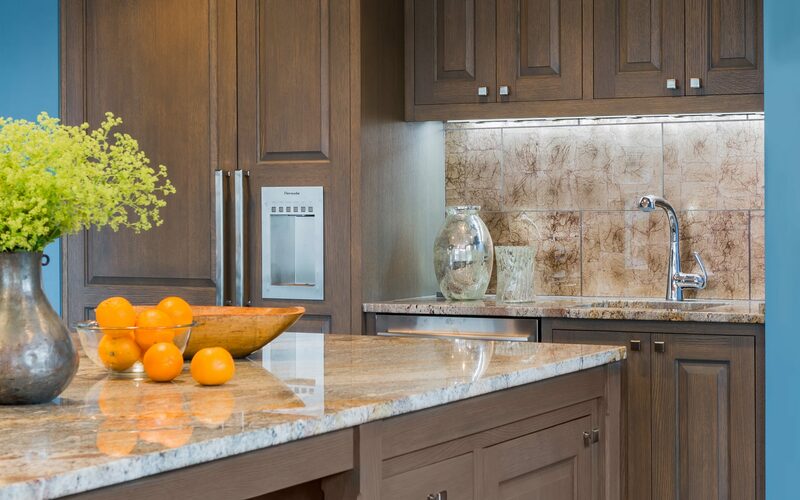 From space planning and layout, to choosing appliances, cabinetry styles, and material selection. If you don’t want to commit to color on all of your cabinets consider introducing color on the island, backsplash, walls, window treatments, lighting, or other accents. 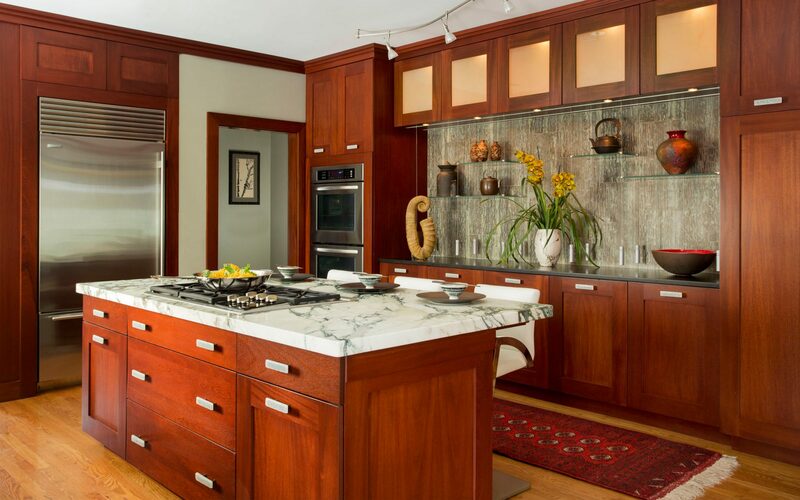 For this kitchen renovation in the suburbs of Boston, we designed the custom-made island cabinet a deep green to accent the natural cherry cabinets. Furthermore, hints of this green are reflected in the countertop, as well as the window treatments in the adjacent breakfast room. 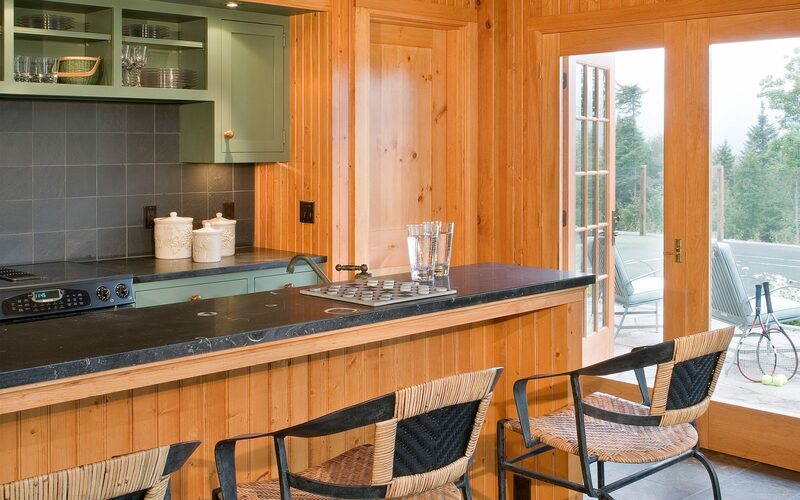 We designed this contemporary Vermont farmhouse with a warm color palette. The perimeter cabinets are a stained wormy butternut wood and the walls painted a soft yellow. 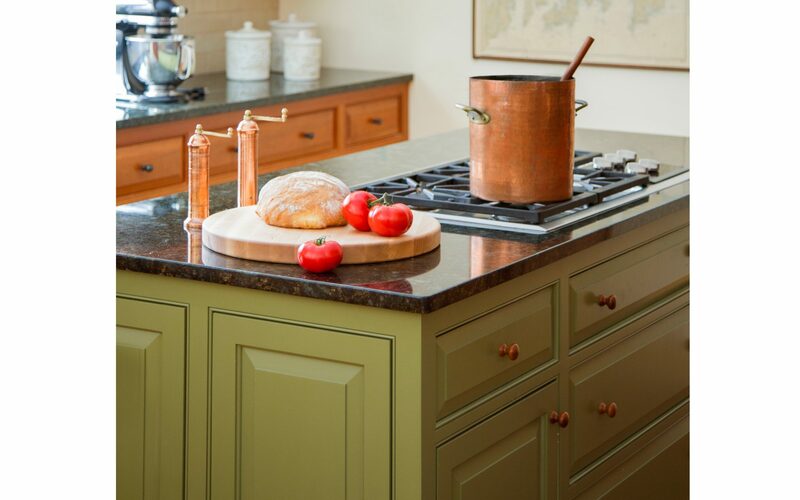 To complement the warm hues, the large center island has a distressed teal painted finish. This coordinates with the teal color scheme in adjacent rooms of the home, resulting in interior spaces that relate to one another by simply adding color. If your preference is stained wood cabinets, consider accenting them with color on your walls. There are numerous wood cabinetry options to choose, from contemporary to traditional and timeless. This homeowner requested their seaside retreat be a ‘city home with country charm’. During this renovation we accented the warm neutral color palette of the pickled oak cabinets with a bold blue wall, creating a kitchen that is harmonious with the ocean setting. In the adjacent breakfast nook we added bold warm colors opposite the cool blues from the kitchen walls. 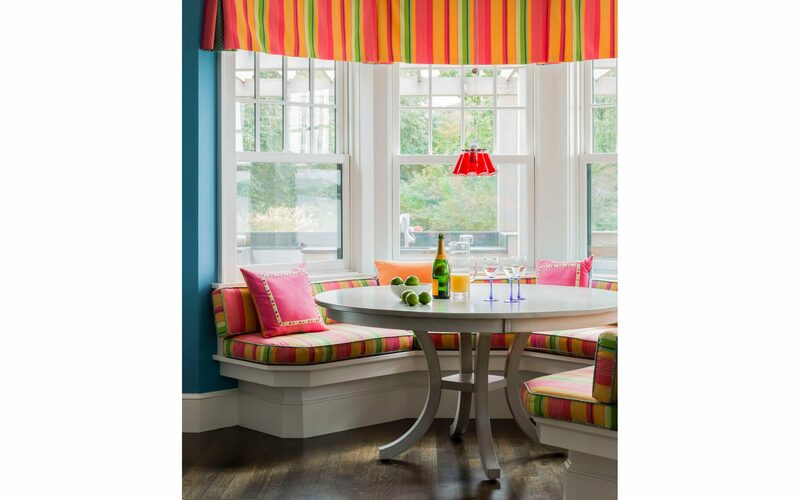 Colorful fabrics for the valance and built-in window seat coordinate with a contemporary glass pendant light over the table. The result is a cheerful, colorful kitchen design that meets the homeowners vision of country and city alike. A colorful kitchen doesn’t necessarily mean bold and bright colors, it can also be muted and neutral. In the North Shore of Boston, Elizabeth Swartz Interiors worked with the homeowners to renovate their outdated interior spaces into a contemporary, art-inspired home. We chose a soft neutral green on the walls, allowing the contemporary mahogany cabinets to become a warm focal point in this new kitchen. Kitchens are the center of family activity in most homes. With many hours spent in and around this space, why not let your kitchen reflect you and your personal taste? A colorful kitchen can be intimidating, but with careful planning, and thoughtful, creative collaboration the kitchen of your dreams will come to life! For more information about kitchen design, or the interior design of distinctive and inviting spaces for you and your family, please be in touch. Great article! I absolutely love the blue in the first three photos. Keep up the great work! 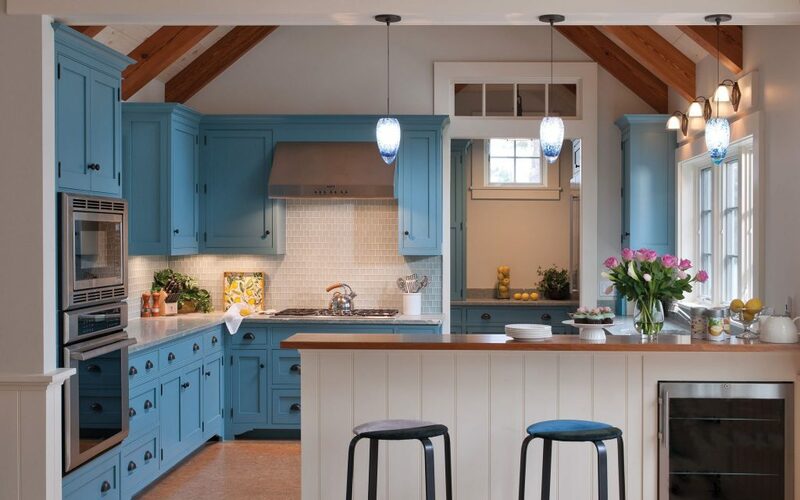 I like your colorful ideas especially the Blue Kitchen in the beach cottage, with the wood beams in the background. I just finished a modern kitchen in Navy, with Walnut accent data strips, and a Walnut hood. Love reading your articles. Stunning work and colors with function at center stage. I love your work! You’re giving me great ideas for my future dream kitchen! I simply loved the kitchen designs!! It is so simple and yet so stylish..Thanks so much for sharing this post…Feeling inspired! !